Launceston captain Tom Rawlings was "over the moon" with his side's 24-24 draw with high-flying Hartpury College in National Two South. "I'm massively over the moon with the boys' performance," Rawlings told BBC Radio Cornwall. "It's been a hard couple of weeks and there's been a lot of soul searching. "But I think we pulled together as a team and showed that we're a really good outfit and when we buy into everything we can play and defend." 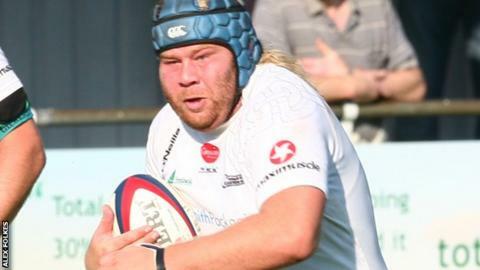 He added: "Last week Hartpury put 40-odd points on Taunton and to come away with a draw was a great effort." They trailed 11-9 at the break after Hartpury's Jack Hayes had scored the only try. Brandon Walker's try put the visitors further ahead before Neilson Webber crossed for Launceston. Jake Murphy's drop goal put Launceston 19-16 up before a penalty and a second for Hayes saw Hartpury go 24-19 up. But Tim Mathias got a try with nine minutes left to level the match.